The term “Walking Dead” is itself an oxymoron. How can a being who is dead possess, for example, the ability to walk? The privilege to actively engage with the environment is a trait that is supposedly reserved only for the living, yet here it exists as a trait describing the dead. This blurring of lines between life and death creates what Jeffrey Jerome Cohen would describe as “category crisis.” To fully comprehend what constitutes the concept of the “walking dead” is difficult. The division here is unclear and exists as a spectrum of characteristics between the seemingly polar opposites states of life and death, the walking dead symbolizing all that lies between the two. The Walking Dead explores the fact that “life” and “death” are not set definitions but instead traits that can be used to describe monsters depending on circumstance. There are scientific explanations for the Walking Dead, where an originally “normal” body is afflicted with a disease or psychopathological disorder. The Walking Dead also encompasses a vast array of beings, from the robot (animated beings comprised of man-made parts) to the previously “dead” that have been reincarnated (by either magical or medical means). 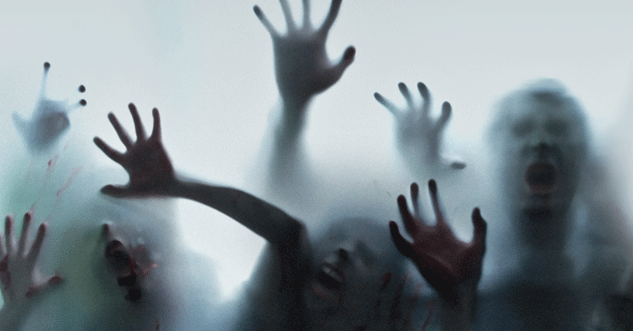 Many of these beings fall under the umbrella term of the “walking dead” unexpectedly. The problem space of the “Walking Dead” lies in the very difficulty of defining what is considered “alive.” It can be argued that living does not require a beating heart and a complex conscience. Living might be said to encapsulate the following qualities: 1) animation, an ability to emote, a capacity to make choices. It is important to clarify that many of these beings only become the walking dead after a major shift in their perceptions. For example, a robot with a predetermined and well-defined set of tasks cannot be labelled as the walking dead until it somehow gains the ability to make decisions for itself. This transition from inanimate to conscious defines the walking dead. These beings embody a wide range of characteristics and roles within their respective realities – the plotting, conscious vampire, the animated doll, the hordes of brainless and instinct-driven zombies. All manifestations of the walking dead, however, challenge traditional correlation of sentience, animation and life. Ultimately, the walking dead is much more than that which is simply “dead” and “walking”; it is a capacious category that encompasses all that juxtapose the idea of natural consciousness and deviations from that natural consciousness within the same body. Abu-Lughod, Janet L. Before European hegemony: The world system AD 1250-1350. Oxford University Press, 1991. Allen, Steven. “Bringing The Dead To Life: Animation And The Horrific.” At The Interface/ Probing The Boundaries 61 (2010): 87-107. Web. Anderson, Daniel. “Love and hate in dementia: The depressive position in the film Iris.” The International Journal of Psychoanalysis 91.5 (2010): 1289-1297. Aquilina, Carmelo, and Julian C. Hughes. “The return of the living dead: agency lost and found.” Dementia: Mind, meaning, and the person (2006): 143-161. Baggett, David and Klein, Shawn. Harry Potter and Philosophy: If Aristotle Ran Hogwarts. Chicago: Open Court, 2004. Print. Behr, Kate E. “Same-as-Difference: Narrative Transformations and Intersecting Cultures in Harry Potter.” Journal of Narrative Theory 35.1 (2005): 112-132. Behuniak, Susan M. “The living dead? The construction of people with Alzheimer’s disease as zombies.” Ageing and Society 31.01 (2011): 70-92. Bell, Micahel M. “The Ghosts of Place.” Theory and Society 25.6 (1997): 813-836. Print. Bergman, Ingmar. “Focus on the Seventh Seal.” Ingmar Bergman. Arts April (1958), n.d. Web. 02 Dec. 2013. <http://ingmarbergman.se/en/production/seventh-seal-15435&gt;. Bernstein, Jane A. “‘Bewitched, Bothered and Bewildered’: Lady Macbeth, Sleepwalking, and the Demonic in Verdi’s Scottish Opera.” Cambridge Opera Journal 14.1-2 (2002): 31. Print. Brittle, Gerald. The Demonologist: The Extraordinary Career of Ed and Lorraine Warren. Chadwick, N. K. “Norse Ghosts (A Study in the Draugr and the Haugbúi).” Folklore 57.2 (1946): 50-65. Print. Chadwick, N. K. “Norse Ghosts II (Continued).” Folklore 57.3 (1946): 106-27. Print.Englewood Cliffs, NJ: Prentice-Hall, 1980. Print. CLASEN, MATHIAS. “Vampire Apocalypse: A Biocultural Critique of Richard Matheson’s I Am Legend.” Philosophy & Literature 34.2 (2010): 313-28. Print. Crisp, A. H., B. M. Matthews, M. Oakey, and M. Crutchfield. “Sleepwalking, Night Terrors, and Consciousness.” Bmj 300.6721 (1990): 360-62. Print. Cowie, Susan D., and Tom Johnson. The Mummy in Fact, Fiction and Film. Jefferson, N.C.: McFarland, 2002. D’Este, Claire, Mark O’Sullivan, and Nicholas Hannah. Behavioural Cloning and Robot Control.N.p. : ACTA, n.d. Print. Ima-Izumi, Yoko. “A Land Where Femmes Fatales Fear to Tread: Eroticism and Japanese Cinema.” Japan Review 10 1998: 123-150. JSTOR. Web. 18. Nov 2013. Katherine Rowe. “The Politics of Sleepwalking: American Lady Macbeths” Shakespeare Survey 57, Macbeth and its Afterlife (2004): 147-156. Kawin, Bruce. “The Mummy’s Pool.” Planks of Reason: Essays on the Horror Film. Ed. Barry Keith Grant and Christopher Sharrett. Lanham, Maryland: Scarecrow Press, 2004. 3-19. Monstrosity, and Capitalism in Richard Matheson’s I Am Legend ?” Journal of homosexuality 60.4 (2013): 532-57. Print. Lauro, Sarah Juliet, and Karen Embry. “A Zombie Manifesto: The Nonhuman Condition in the Era of Advanced Capitalism.” Boundary 2 35.1 (2008): 85-108. Print. McAlister, Elizabeth. “Slaves, Cannibals, and Infected Hyper-Whites: The Race and Religion of Zombies.” Anthropological Quarterly 85.2 (2012): 457-86. Print. McGeough, Kevin. “Heroes, Mummies, and Treasure: Near Eastern Archaeology in the Movies.” Near Eastern Archaeology 69.3 (2006): 174-85. JSTOR. Web. 18 Nov. 2013. <http://www.jstor.org/stable/25067670&gt;. McRoy, Jay, ed. Japanese Horror Cinema. Honululu: University of Hawai’i Press, 2005. Print. McRoy, Jay. Nightmare Japan: Contemporary Japanese Horror Cinema. New York: Contemporary Cinema, 2008. Print. Moravec, Hans, Robots inherit human minds. Murison, Justine S. “The Tyranny of Sleep: Somnambulism, Moral Citizenship, and Charles Brockden Brown’s Edgar Huntly.” Early American Literature 44.2 (2009): 243-70. Print. Ng, Andrew Hock-Soon. “ ‘Death and the Maiden’: The Pontianak as Excess in Malay Popular Culture.” Dracula, Vampires, and other Undead Forms. Ed. Browning, John Edgar, and Caroline Joan Picart. Lanham: Scarecrow Press, 2009. Print. Rodney A. Brooks, Technologies for Human/Humanoid Natural Interactions. Shaheen, Jack G. “Reel Bad Arabs: How Hollywood Vilifies a People.” Annals of the American Academy of Political and Social Science 588 (2003): 171-93. JSTOR. Web. 18 Nov. 2013 <http://www.jstor.org/stable/1049860&gt;. Shuk-ting, Kinnia, Yau. “A ‘Horrible’ Legacy: Noh and J-Horror.” East Asian Cinema and Cultural Heritage: From China, Hong Kong, Taiwan to Japan and South Korea. Ed. Yau Suk-ting, Kinnia. New York: Palgrave Macmillan, 2011. 101-124. Print. Stewart, Geroge R., Jr. “A Note on the Sleep-Walking Scene.” Modern Language Notes 42, no. 4 (1927): 235-37. Swinnen, Aagje. “Dementia in documentary film: Mum by Adelheid Roosen.”The Gerontologist 53.1 (2013): 113-122. Weinstock, Jeffrey Andrew. “Vampires, Vampires, Everywhere!” Phi Kappa Phi Forum 90.3 (2010): 4-5. Print. Zeilig, Hannah. “Dementia as a cultural metaphor.” The Gerontologist (2013).